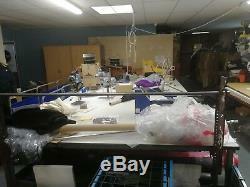 Used, heavy duty, very large, fabric cutting table. Lower shelf for storing fabrics on. Dimensions: 2.17m x 5m. N extra 2 supporting legs (but no extra top). 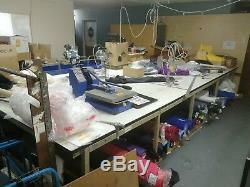 Please excuse the mess in the photos, the table will be fully cleared and cleaned prior to sale. Collection only from Telford, Shropshire. The item "Very large, heavy duty, fabric cutting table" is in sale since Wednesday, November 14, 2018. This item is in the category "Business, Office & Industrial\Manufacturing & Woodworking\Textile/Clothes Manufacturing". The seller is "myworkwear" and is located in Telford. This item can be shipped to United Kingdom.